Baron Ferdinand de Rothschild, how he was referred to in the UK, or Ferdinand James Anselm, Freiherr von Rothschild (17 December 1839 – 17 December 1898) was a French-born, Austrian-turned British and Jewish banker, art collector and politician, who was a member of the prominent Rothschild family of bankers. He identified as a Liberal, later Liberal Unionist, MP who sat in the House of Commons from 1885 to 1898. Ferdinand had a sister, Miss Alice, who like her brother was a keen horticulturalist and collector. She inherited Ferdinand's property, Waddesdon Manor, in 1898 after he died and likewise continued the tradition of using the house as a place to keep his impressive collections. Although Ferdinand de Rothschild was born in Paris in 1839, he was from Vienna and a member of the Rothschild banking family of Austria. He was the second son of the Viennese Baron Anselm von Rothschild (1803–1874) and his English wife Charlotte von Rothschild née Rothschild (1807–1859). Ferdinand's great-grandfather was the Mayer Amschel Rothschild. Although possessing the hereditary title Freiherr (Baron) from the Austrian nobility, he was familiarly referred to as 'Ferdy' by his sister, Miss Alice and friends. When Ferdinand became a British subject and moved from Vienna to London, "[he] epitomised the expanding lifestyle of the fourth generation". This statement is more evident when, on 7 June 1865 he married his second cousin Evelina de Rothschild (1839–1866), the daughter of Lionel de Rothschild (1808–1879). On 4 December 1866 their son was stillborn, and Evelina died later the same day. In her memory, Ferdinand built, equipped and endowed the Evelina Hospital for Sick Children in Southwark, south London. From 1868 to 1875, he became Treasurer of the Jewish Board of Guardians and Warden of the Central Synagogue in 1870. During these roles, Ferdinand instigated an offer of £2,000 which ultimately led to the foundation of the Army Reservists' Home. 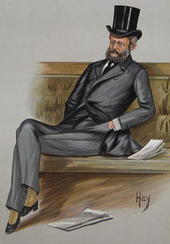 In 1883, Ferdinand de Rothschild was High Sheriff of Buckinghamshire. He was adopted as Liberal candidate for the London constituency of St George's in the East but on being invited, he contested in 1885 another seat, at Aylesbury which he won and held until his death. In 1886, over the issue of Irish Home Rule, he joined the Liberal Unionists, and hosted meetings at Waddesdon Manor (where Joseph Chamberlain, Arthur Balfour and Lord Randolph Churchill were often guests) that led to the formation of the Unionist-Conservative alliance. From 1896 he was a Trustee of the British Museum, a role suggested by Sir Augustus Wollaston Franks  and leads to his Renaissance collection becoming bequested to the British Museum after his death. This is now exhibited as the Waddesdon Bequest. Ferdinand de Rothschild died at Waddesdon Manor on his 59th birthday, and thought to be the result of a cold caught when last visiting his wife's tomb. Ferdinand de Rothschild was buried next to his wife in the Rothschild Mausoleum in the Jewish Cemetery at West Ham. Waddesdon Manor was the weekend 'party house' of Ferdinand de Rothschild, where he entertained many famous and royal guests whilst showing off his diverse 19th century collection. Fluent in three languages, and considered "as much at home in Paris as in London", Ferdinand was an already inspired collector of eighteenth-century french decorative arts from his early twenties. For instance, when he was simply 21 years old his first purchase was made on one of the most ostentatious rococo Sevres ship vases from the Louis XV era. His development into one of the most renowned collectors of the 19th-century, even amongst the Rothschilds' is known by the abundance of family letters in which he is referred to as "curiosity-hunting... all over Europe". In the autumn of 1874, Ferdinand de Rothschild bought land in the village of Waddesdon in Buckinghamshire from the Duke of Marlborough in order to build a property in which he could house his diverse collection. From 1874 and 1889, architect Gabriel-Hippolyte Destailleur designed and built Waddesdon Manor, a 19th-century manor based on the 16th-century French Chateau de Chambord. He sought to 'revive the decoration of the eighteenth century in its purity, reconstructing the rooms out of old material, reproducing them as they had been during the reigns of Louis'. Miss Alice, in turn, then bequeathed the estate to their nephew, James Armand de Rothschild. Following James' death, the manor passed to the National Trust. ^ a b Roth, Cecil (1939). The Magnificent Rothschilds. Robert Hale. p. 197. ^ a b c 1931-, Girouard, Mark, (1998). A hundred years at Waddesdon. Buckinghamshire, U.K.: Rothschild Waddesdon. ISBN 0952780925. OCLC 695587648. ^ The Magnificent Rothschilds. p. 198. ^ The Magnificent Rothschilds. p. 197. ^ The Magnificent Rothschilds. p. 192. ^ Schwartz, Selma (2000). Waddesdon: The Rothschild Collection Guide. National Trust Charity. p. 4. ^ Hall, Michael (2002). Waddesdon: The Biography of a Rothschild House. New York: Harry N. Abrams. p. 15. ^ Baron Ferdinand de Rothschild, The Red Book (1897: Waddesdon Archives). Seccombe, Thomas (1901). "Rothschild, Ferdinand James de" . Dictionary of National Biography (1st supplement). London: Smith, Elder & Co.
Davis, R. W. "Ferdinand James von Rothschild". Oxford Dictionary of National Biography. Oxford University Press. Retrieved 28 April 2006. Wikimedia Commons has media related to Ferdinand James von Rothschild. This page was last edited on 21 April 2019, at 10:45 (UTC).